One of the many Saints, Blesseds and holy persons devoted to Saint Gemma was the American mystic and stigmatic, Marie Rose Ferron from Woonsocket, Rhode Island. In the photo to the left we see Marie "Little Rose" Ferron in ecstasy smiling at her vision. 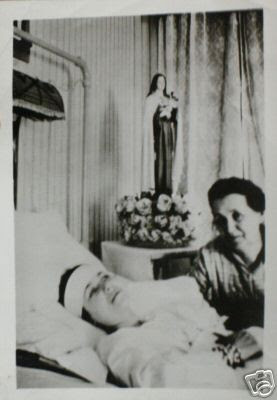 On the dresser next to her we see several statues, the one to the far right being St Gemma Galgani of whom Rose was very devoted to (the other statues are also named in the caption at the bottom of the photo). 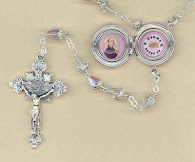 In fact, those interested can click here for more info about Marie Rose Ferron's devotion to St Gemma . Editors Note: I humbly submit this information on the life of Marie Rose Ferron with complete obedience to the authority of the Catholic Church, who alone has the power to judge the sanctity and holiness of individuals. Since Marie Rose Ferron has not thusfar been Beatified or Canonized, this information rests on human authority alone, and this writer humbly submits himself, without reserve, to the supreme authority and judgement of the Catholic Church. Marie Rose Ferron was born on May 24th, 1902 in St Germain de Grantham, Quebec, and was the tenth child of a family of fifteen children. When Rose was 4 ½ years old, her family moved to Fall River, Massachusetts, then on May 25, 1925 they moved once again to Woonsocket, Rhode Island. "While I was gone in one of my dreams (for this is the name she gave to her ecstasies), I saw the Blessed Virgin Mary; She unrolled the fifteen mysteries of the Rosary; they were passing before me as She unrolled them, until the movement stopped at the fifteenth mystery. At the end, I read the name of my own mother. I understood that my mother had had fifteen children, in honor of the fifteen mysteries of the Rosary. marked with the stigmata of the crucifixion, because I was the tenth child of the family." "At the age of three, she had taken a particular liking for St. Anthony of Padua. If someone in the household lost something, she claimed the privilege of invoking her favorite Saint and with his help she always found that which was lost. She was very precocious, as regards intelligence and piety. At the time they left Canada for the States, when their house was practically empty, the family found her in front of St. Anthony's picture telling him that she would not leave him all alone. On another occasion, her father, a very practical and down-to-earth man felt rather irritated hearing Little Rose state that St. Anthony himself would tell her where to find lost articles. So, he planned to give her a good lesson and told his wife about it. Upon returning home from work, he took his boots to the other side of the railroad tracks. The trains passed at the limit of their humble apartment. After supper, he asked Little Rose to hand him his boots in order to fetch wood in the back shed. Joyfully she dressed up, crossed the railroad and returned with her father's boots. The family tells us that from then on, Mr. Ferron never questioned her relationship with St. Anthony." During her teenage years, Marie Rose became ill with a mysterious paralysis and painful contraction of the muscles in the legs, feet, arms and hands, and also an intestinal problem which rendered her practically unable to eat and she also contracted Tetanus (lockjaw) and Pyorrhea. Due to the progression of the paralysis in her legs, she was eventually completely bedridden. As a soul victim, according to her ability, like "her Jesus', she bore infirmities of the sick and was afflicted for sinners. Due to her illness, she had to have many teeth extracted and a plate installed in her jaw. Her left hand was shrunk to half its size and clenched, causing her nails to pierce her palm. Dr. Gendron tells us that her feet were twisted, clubbed and rotated inwardly; and her legs were in a state of complete atrophy. Because at times her muscles would painfully contract, making it very difficult to straighten her once again, a flat board was placed on her mattress and she had to be strapped to this board, and thus she remained on the board continually for the rest of her life. One can only imagine the suffering of spending year after year, mostly paralyzed and lying atop a hard board. "When I was seventeen, one summer day, as the windows were open, I heard someone chattering and laughing down below, I leaned forward to see what was going on. There were a number of girls of my age; my friends and sisters were there. They were all dressed up in their Sunday clothes and leaving for the church. I heard them laugh from the window, they chatted, laughed and joked. The life that bubbled from those young girls seemed to be the best the world could give, and when I contrasted their condition with mine, I was literally crushed. I saw myself miserable, destitute and God-forsaken; I thought of my infirmities, of my crutches. I was heart broken. I wept bitterly. Oh, if you only knew how I felt! "In time, Marie Rose resigned herself to God's will, and she accepted sickness as her vocation and even rejoiced for having been chosen to suffer with Christ. “In 1927, during Lent, Rose had the stigmata of the Scourging; they were the first ones to appear and the first ones to attract attention. On being asked by Father X, Rose showed me her arm. The outer arm was lacerated with red and purple stripes, about one-half inch in width. These stripes were swollen and quite close to each other. The arm looked as though it had been lashed with whips. Rose was asked if those welts were very sensitive. She answered that they were painful, like a burn. I asked her if her clothes adhered to her arm when they were oozing blood? ... "Yes," she answered, and added, "and it takes a long time to loosen them; I manage only a little at a time, the pain is intense, it is like pulling off the skin." When I told her she should use warm water, she answered: "But then, it is unbearable; it is like fire." "I did not see the stigmata of her forehead, for they were hidden, by her head cloth, but the blood came streaming from beneath and ran down her cheeks, here and there. From her eyes, I saw the blood bubbling like water that boils, and I sponged it off with my handkerchief. The eyes were full of blood and her lashes were partly stuck together, which almost blinded her. On the right side of her neck, appeared another red blotch. There was also one below her throat, on the upper part of her chest. At every moment, she would ask for the time and for our blessing. It is already 2:45 P.M. Rose begins to tremble and moves her head from one side to another, her expression was that of pain and of anguish. The crucial moment is approaching. With a sign of her hand, she tells us to walk out. We leave, to come back a few minutes later. But then, she was gone into ecstasy. It is now about 3 P.M. The crucifixion is coming to an end. After a few minutes, she began to converse with her Jesus." 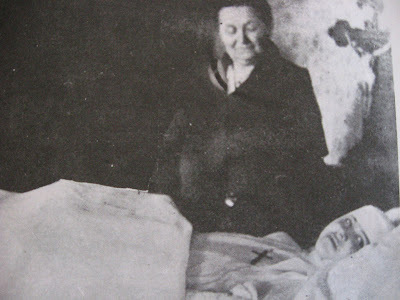 Father Boyer then goes on to document the stigmata wound of the heart, that is, a chest wound that appeared on the side of Marie Rose, and also another wound that often appeared on her shoulder. attached no great importance to such signs. "Grind up all your sufferings in the mill of patience and silence; mix them with the balsam of the Passion of the Savior; make them into a small pill and swallow it with faith and love and with the fire of charity, digest it." Mary. During these visions, she was completely immovable, as if a lead statue. This phenomenon was verified countless times by numerous people; priests, physicians, friends and family throughout the course of many years. "Oh Jesus, yes I love You, and I wish without a shadow To love You more than myself; oh Jesus, yes, I love you! You alone are my happiness, yes, I want to live for you, my Jesus! It is for you, oh my Jesus, I also wish to suffer; oh Jesus, for You alone! If it is the will of my heavenly Father, I do wish and long to die ...Oh Jesus, you are my happiness!" "Oh Mary, my sweet Mother, come to the help of your child. Protect also my little mother, through whom I have learned to love you. Keep us all close to you, oh Virgin Mother, bind us in the links of your Rosary. Oh Virgin Queen, protect your children. Oh Virgin Queen, you have always said ... ‘Ask much, because I love generous hearts’ -You see, I have done so!" (She laughs).Often she would be heard softly singing in an ecstacy to Jesus or Mary in the middle of the night. It should be noted that Rose had a great devotion to Jesus in the Eucharist and also to the Blessed Mother and the rosary. 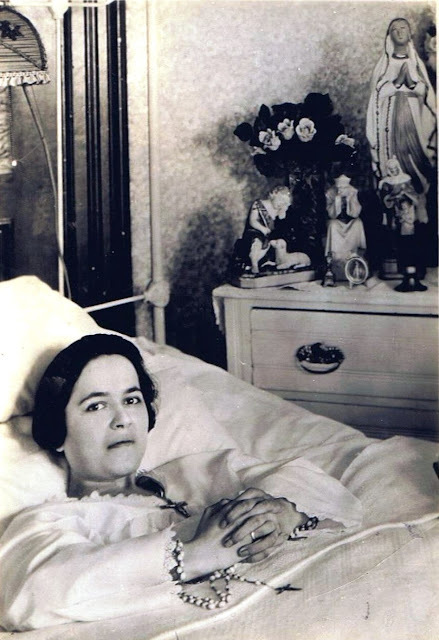 She always kept a Rosary forever wrapped in her hands, as can be seen in the pictures of her. She once said “when I don’t have enough time to say a rosary, I simply say on each bead “My God, I love You! “During April and May, 1931, I was able to get an impression of Rose's mouth, under much difficulty; because, while working, she would lapse into a coma dozens of times, and she would then become ankylosed. I constructed for her a full upper denture. The day this denture was made, while I was making minor adjustments, Rose's mother walked into the pantry where I was working and as I held it in my hand, to her amazement and mine, an 'Ecce Homo,' in all its glory appeared in the vault of the denture. This was also witnessed by the father [Mr Jean-Baptiste Ferron]. All this occurred on May 14, 1931, at about 3 P.M. I then went to Rose's room at once and told her about it. After hearing me, she said: 'Don't mention what you saw.'" "Later, on several occasions, up to the time of her death, I had to make further adjustments, and the 'Ecce Homo" still appeared. The face of the Lord appeared very sad, at all times, but the expression varied from time to time ... the halo, over the head, was very visible, brilliant and vibrating. My wife and Mrs. Ferron can verify the above. Rose told me, that at the time of her death, I could have the denture; when she died, however, several persons tried to remove it, but to no avail. "I have seen Rose many times, in fact, I was quite a frequent visitor. 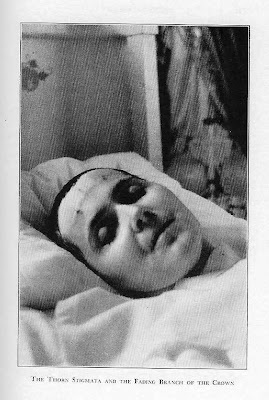 Besides seeing her in a coma, with her eyes upwards, I also observed the stigmata of her forehead and those of her hands. "When in a coma, her mother and I observed what a tremendous dead weight she was! Many attempts were made to lift her head from her pillow; the head was so heavy that neither I, nor anyone else was ever able to lift it, no matter how much strength we used. "When I called on Rose, I naturally tried to console her in her trying moments; I never could understand how so much suffering could be endured, if she hadn't had the Lord with her at all times." When Rose was yet but seven years of age, Jesus taught her the following prayer, which she said daily, without fail. "Oh Lord Jesus, when I reflect upon the words which Thou hast uttered: 'Many are called, but few are chosen,' I fear and tremble for those I love, and I beg You to look upon them with mercy; and behold, with an infinite tenderness, You have placed their salvation in my hands, for everything is assured to him who knows how to suffer with Thee, and for Thee. My heart bleeds under the weight of suffering, but my will remains united to Thine, and I cry out to You: 'Lord it is for them that I want to suffer .... I wish to mingle my tears with Thy Precious Blood for the salvation of those I love! 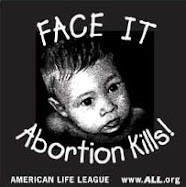 You will not turn a deaf ear to my sorrowful cry .... and You will save them.' "
Once she told of a vision of the Child Jesus: "I saw Him," she said, "with a cross, he was looking at me with grief in his eyes." Years after this vision, some one gave her a statue which she recognized as the very figure she had seen .... "Have you remarked," she once said to Father Leonard, "the statue of the Child Jesus carrying his cross? ... I see Him often as he is here represented. I speak to Him and He speaks to me; this statue however, is but a poor representation of what I actually see." 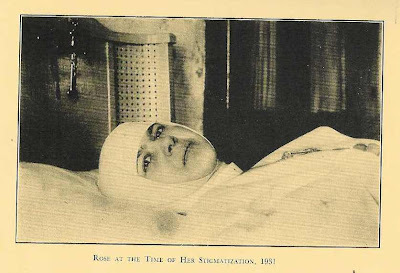 In 1929, seven years before her death, Jesus informed Rose in an ecstacy that, like Him, she would die at the age of 33. Father Boyer happened to be there at that moment, along with a few others, and they were of course very surprised at this revelation. He noted the date of the ecstasy and later wrote about it in his book. 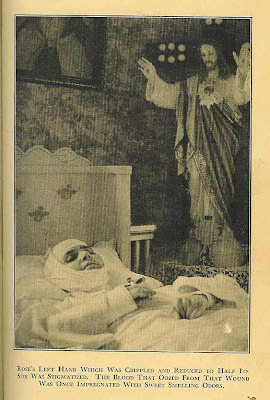 After an intense period of suffering in union with Jesus for the conversion of sinners, Marie Rose Ferron took flight to heaven on May 11, 1936, at age 33, just as she was told by Jesus in ecstasy some seven years before. After her death, many miracles were attributed to her intercession. Many of these miracles are documented in the books below. Also, many people have documented the smell of roses while praying to Marie Rose. They attribute this as a sign of her heavenly presence. Source for this information is from the excellent book “She Wears a Crown of Thorns” by one of her spiritual directors, Father O.A. Boyer and also “A Stigmatist Marie Rose Ferron” by Jeanne Savard Bonin. I aquired a somewhat rare book entitled "Tape Recorded Little Rose Testimonies" by Father John Baptist Palm S.J., May 11, 1970, Maria Mater Spei Publications. The book is very large, 2094 pages and is Rose in color (in honor of Little Rose). This book is a treasure of information concerning the holy life and virtues of Mary Rose Ferron. In it are literally hundreds of eye witness testimonies of those who knew her, including some of her family and extended family members, Physicians, and also those who received some extraordinary graces through her intercession after her death. Over the course of several years, the author, Rev. John Baptist Palm S.J. intereviewed hundreds of people, and tape recorded all the interviews, and then with the help of numerous translators and typists, converted all the testimonies into this large book. Marie Rose Ferron's extraordinary love for God and souls shines through in page after page of the testimonies. The book was originally published and sent the all the Bishops in the United States, especially the ordinary (Bishop) of Providence, Rhode Island, in hopes that by giving incontestable evidence of the heroic virtues of Mary Rose Ferron, it might help to open the way for her cause for canonization. All the works of God are persecuted and the Saints along with them. In fact, the Church considers persucution in the life of a Saint to be a sign of authenticity and one of the hallmarks of holiness. And, history shows us that the mystics in the Church are normally persecuted even moreso. (cf. Sts. John of the Cross, Teresa of Avila and in our time S. Pio for example). In the life of Marie Rose Ferron we read that there were 3 persons who intitally befriended her, but sadly turned against her and her family and falsely accused her of the most ridiculous things, such as eating steak dinners with her parents in the middle of the night and walking about the town late at night, when several physicians, nurses and others attending her have formally testified that Rose was a parapalegic, confined to her bed in her late teens, with severly clubbed and contorted feet. The most unfortunate thing however, was that there were a number of people, including the local Bishop(s), who apparently believed such nonsense, when literally dozens of people (judging by my readings, I would say close to 50) who knew Rose personally have testified otherwise. While it is not surprising that a victim soul like Marie Rose Ferron would have 3 persons turn against her (after all Jesus had Judas, and the disciple is not above the Master) what is surprising is that perhaps several past Bishops of the Catholic Church would not see through such a ruse for what it is. In the judicial system, there is a common method or standard for determinig the probable authenticity or truth of a matter; it is called the "proponderence of the evidence". So we have on the one hand the ridiculously slanderous statements of 3 individuals, accusing Rose of eating steak dinners and walking about the town of Woonsocket in the middle of the night, and poking herself with pins to "create" the stigmata, versus the hundereds of eyewitnesses, including Physicians, Priests etc. in the 3 books I have mentioned above concerning her virtuous life. As the local and regional newspapers state, there were and estimated 15,000 people who attended her funeral rites. Were these people perhaps all decieved? Were her parents and all her sisters and brothers decieved? Were all the friends of her family decieved? The brothers and sisters in law, the Doctors, her Dentist, other caretakers, the countless visitors who came from all over the Northeast to share their sorrows and concerns with this "Little Rose"... all these were decieved? The overwhelming propondrence of the evidence is in favor of her life lived in sacrifice and suffering out of love for God and souls. Rev. Onesime A Boyer S.T.L. and Rev. John Baptist Palm S.J. A final note about two of the Priests who admired the virtues of Marie Rose Ferron and sought by their books to bring forth the light and truth concerning her holy life. 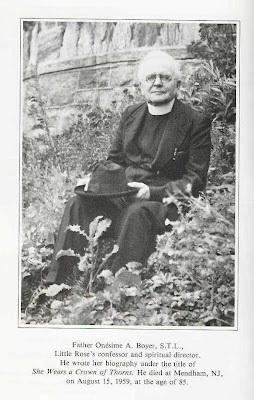 Father Onesime A. Boyer S.T.L., author of the book "She Wears a Crown of Thorns" died on the feast of the Assumption of Mary, August 15, 1959. Father John Baptist Palm S.J., author of the book "Tape Recorded Little Rose Testimonies" died on the feast of the Nativity (Birth) of the Blessed Virgin Mary, September 8, 2009 (a month prior to this writing). "...My heart bleeds under the weight of suffering, but my will remains united to Thine, and I cry out to Thee: Lord it is for them that I want to suffer .... I wish to mingle my tears with Thy Precious Blood for the salvation of those I love!..." This was truly an inspiring post to read! I never knew of this woman, thank you for bringing her into the light for us! I am glad you enjoyed reading about Marie Rose Ferron. I only touched upon a little bit of her extrordinary and inspirational life. There really is so much more to be said about her, but those interested can read more in the excellent book "She Wears a Crown of Thorns" by Father O. A. Boyer. Thank you for this story...I am going to read it again and again...it truly warms my heart. Here is the official death notice for Rev John Baptist Palm S.J. Fr. John Baptist Palm S.J. Fr. John Baptist Palm, 95, died September 8, 2009 at Sacred Heart Jesuit Center, Los Gatos, CA. He was an ordained priest for 68 years and a Jesuit for 65. In 1948 he began parish ministry at Christ the King Church, Shanghai, China. He served there until his arrest by the Communists on the night of June 15, 1953. Palm was expelled from Shanghai on July 26, 1953. John went to Hsinchu, Taiwan, where he was assistant pastor. He remained there until 2003. For many years he worked with the parish's social outreach. "I have charge of the city's Taiwanese poor," he wrote in the mid-fifties. He also served as director of the Apostleship of Prayer, and later was named promoter of the Charismatic Renewal Movement in Taiwan. Finally, failing health brought him to Sacred Heart Jesuit Center in 2004. Fr. John Palm's funeral Mass will be held on Tuesday, September 15, at 10:30 AM at Sacred Heart Jesuit Center, 300 College Ave., Los Gatos, CA. Donations in memory of Fr. John can be made to the California Province of the Society of Jesus at P.O. Box 68, Los Gatos, CA 95031. Arrangements by Darling-Fischer Chapel of the Hills in Los Gatos, CA. St. Gemma's story was very inspiring. I know of Marie Rose Ferron and it was so very kind of this Site to speak of her life- I ask that all who read this site about Little Rose will pray for the Bishop of Providence .RI to officially reopen her case for a complete Commission on her life. thank you. Thank you for your kind comments. I have visited your informative website on Marie Rose Ferron on a few occasions and I appreciate the wonderful information that you have provided there. I unite with you in prayerful hope that the Bishop of Providence may research and investigate her holy life, and if God wills it, open her cause for canonisation. The hundreds of witnesses who testified in Father John Baptist Palm's 2094 page book "Tape Recorded Little Rose Testimonies" certainly provide an overwhelming chorus of praise in testament and honor of her life of extraordinary sacrifice and her heroic virtues, along with the testimonies and facts presented in Father Boyers book on Marie Rose Ferron and also Jeanne Savard Bonins book. May God bless you and your apostolate in honor of Marie Rose Ferron. I found your website and am so please to have found you. I was blessed to have met Father O. Boyer, as a young woman. That was the beginning of my journey with Little Rose. 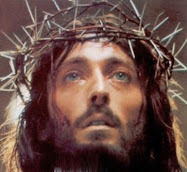 Father wrote the book "She wears a crown of thorns"in which, he shares the virtues and sancticy of this victim soul. He was also her spiritual director. On a particular occasion I had the opportunity to visit his grave and spend time in prayer. I will continue to pray that all those involved in promoting this "Movement" will continue to be faithful and steadfast, trusting in the love and mercy of God. Be assured of my contiued prayers. It is really a pleasure to meet you! Thank you for your kind comments. I am really glad to hear of your devotion to Marie Rose and also that you were able to meet Father Boyer many years ago. -That is wonderful! days ago said "she was the most joyful and happiest person I have ever met". so I was (and still am) very much inspired by her remarkable life of love and sacrifice. the various mystical gifts and graces in the life of Marie Rose Ferron. Rose Ferron to His Excellency, Bishop Thomas J. Tobin of Providence. I received in reply a nice letter from the Chancellor, which I have kept. to her, and ask for her prayers and her help. "special Saints" in a lifetime that he or she feels a special union and relationship with. Well, for me, Marie Rose is definitely one of those very special friends in Jesus. that came from her heart overflowing with the love of her Jesus! How I would have loved to have heard that song! chance, perhaps you (and others)can write a little about your devotion to Marie Rose and how her example has inspired you. Hi,i have a great devotion for Marie Rose Ferron who was born in Quebec(Canada).Since i am also suffering like her,she is a great model for me and i am sure that she help me in my illness.Thanks for all beautiful words of wisdom written here.Simon from Quebec. I was amazed at the wonderful information that was on this website. Marie Rose Ferron was a remarkable person that should have been elevated to the level of saint many years ago. I have known of Rose for my entire life. My grandmother had a deep devotion to her and knew some of her family. 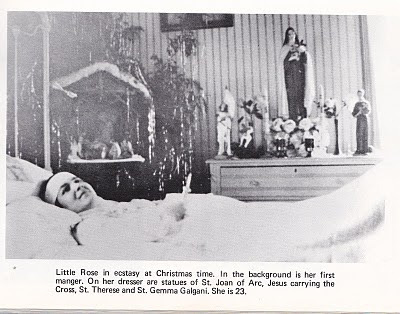 As I child I can remember going to the home and seeing the shrine two or three times until the fateful Sunday when the Bishop (McVinney)had the pastors of his churches read a letter against Rose and those who had devotion to her. My mother was so shaken by this letter that my name was changed from Marie to Maria so no connection would be made. To this day, my mother refuses to hear anything about Rose because of that letter. Now that I am an adult, I have taken to use Marie Rose because I am proud to have been named after her. I hope those who see this site will want to learn more about Rose and her cause. THe cause needs all the help it can get, both support and monetary so that we can get her cause to Rome. I pray daily that she will be recognized as the saint she is during my lifetime. Thank you for your comments. I couldn't agree with you more- Marie Rose Ferron is indeed a great model and example of Christian suffering, especially suffering in union with Jesus. Indeed, the Decree of Bishop McVinney in 1964 was a difficult trial for those who, especially at that time, supported the proposed cause for the Canonization of Marie Rose Ferron. In the summer of 2006, I wrote a letter to His Excellency, Bishop Thomas J. Tobin of Providence, Rhode Island. In the letter I spoke of Rose's extraordinary holiness and virtues, and I also expressed a desire that a cause for possible canonization may be opened. Shortly after, on September 20, 2006, I received a very kind reply from Rev. Monsignor Paul D. Theroux, the Vicar General and Moderator of the Curia for the Diocese of Providence, RI. In the letter, Monsignor Theroux kindly explained the history of the proposed cause of "Little Rose". He explained that up to the 1950's there was "extensive inquiry" into the life of Marie Rose Ferron, and he further stated that "although there were many signs of piety and great faith, there was insufficient evidence to meet the stringent requirements for formal canonization". Rev. Monsignor Paul D. Theroux further stated that "Since then, in response to requests similar to yours, the case has been re-examined several times. As recently as 1998, I was personally involved in such a study." "The consistent conclusion has been that the availible information would not adaquately support a new petition to the Holy See." "It would seem that Little Rose was indeed a very spiritual person, and quite possible one of the many unheralded saints. You are certainly correct in saying that many people have been inspired by her example of Christian suffering, and there is no problem with individuals having a personal devotion to her. However, we simply do not have sufficient evidence to meet the requirements for a formal cause for sainthood"
It was with joy that I recieved this kind reply from the Vicar General, Rev. Monsignor Paul D. Theroux, because I see in the facts presented that once again, in 1996, because of the many requests, the Diocese at least was reconsidering (seemingly and hopefully with a openness) the holy life of Little Rose. Personally, I don't know whether it is God's will or not that Marie Rose Ferron be formally canonized a Saint. 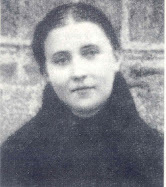 Having extensively studied her extraordinary mystical life and heroic virtues, I certainly see a remarkable likeness to Saints that are already Canonized, such as Saint Gemma Galgani, the subject of this Website. I humbly leave the possibility of the canonisation of Marie Rose Ferron into the hands of the God through His Church, in complete obedience to the authority of the Catholic Church, Who alone has the power to judge the sanctity and holiness of individuals. In light of the numerous emails and comments that I have received concerning this first article above on Little Rose, (I received 3 comments in the past 2 days, for example) I have decided to create a second article, to provide a greater insight into the heroic life of Little Rose. Many thanks for updating your web site with details on the life of stigmatic Marie Rose Ferron. Like many others I never even heard about this soul until I came across her on your web site. Thank you Paul for your kind comments. This story moved my heart. I feel so privileged to learn about Mari Rose Ferron's humility and love for her family rewarded by a close relationship with Jesus. She made my pains fly away. Thank you for your kind comments. I am glad to hear that you were inspired by the heroic life of Marie Rose Ferron. My father had a devotion to "Little Rose" and I received my middle name through this devotion. My father had a copy of "She wears a crown of Thorns" which was well worn on his nightstand. How he became acquainted with her, I am not sure as he passed away in 1970, but his devotion to "little Rose" and our Lord lives on. I gave my middle name to my daughter, who has now passed it onto her daughter! Thank you for the article. Thank you for your comment. It is wonderful to hear of your fathers devotion to "Little Rose". By the way, her unofficial "feastday" is tommorow, May 11, which is of course the anniversary of her holy death. we have been protected from fire more then once and car accidents , motorcycle accident just to name a few.... may you to find protection in Jesus Name!!! I've been familiar with the story of Little Rose since I was a youngster. I had heard many stories about her life through my mother who grew up in Woonsocket RI (born 1914). My great-great-uncle was a monsignor and pastor of one of the more significant French (French-Canadian)parishes in Woonsocket, so I was also familiar with stories about Blessed Brother Andre Bissette CSC (canonization set for October 17, 2010)visiting Woonsocket for other purposes but also visiting Little Rose around the same time. I first read the book "She wore a Crown of Thorns" in 1960. Through the years, I have always been curious as to why there has been little mention or connection with the concurrent Sentinelle Affaire, which was part of the background history at approximately the same time period in Woonsocket as Rose's stigmatical sufferings. I had heard, Rose offered many of her sufferings in prayer, imploring the restoration of peace and harmony in the Church because of the dissension taking place between the Catholic French Canadian Nationalists (Sentinellists) and the Irish bishop in Providence, Bishop Hickey. I had heard that because of flash sentiments at the time, church politics in the Diocese deferred involvement in pushing forward Rose's cause so as to not reopen any sensitivity wounds, and apparently they continue to this day. In retrospect, given examples of Church politics, it took 500 years to canonize St. Joan of Arc, who today is recognized as one of the patron saints of France. Who but God knows where Rose's cause will eventually lead and in what time frame? It is really a pleasure to meet you. Thank you for your comments and especially for the information that you provided about Marie-Rose and the “La Sentinelliste” affair. You are very right that Marie Rose was intimately bound in the affair concerning the Sentinellist's, because the Bishop asked her to suffer in reparation, that those excommunicated might be brought back to the Church. Rose accepted to suffer and sacrifice for those involved, and soon afterwards every single one of those excommunicated came back into the Church. In fact, if you or others are interested, I wrote another article about Marie Rose that explains the whole La Sentinelliste affair here. I would be interested to hear your comments concerning it. Also your comments concerning the effect that the Sentinellists affair had in possibly hampering her cause for canonisation is very interesting, and indeed very possible. I have never come across any information concerning this. I do know that it has frequently been stated that sadly the false testimonies of 3 indivuduals caused Bishop Hickey to change his mind about Rose. These 3 people's testimonies where later proven to be completely false and unjustified in Father John Baptist Palm's 2094 page book "The False Front Case against Marie Rose Ferron- Tape Recorded Little Rose Testimonies", a copy of which I own. This extensive book completely overturns the false testimonies of the three individuals. The tragic thing is that Bishop Hickey believed them. It reminds me of when St (Padre) Pio was unjustifiably sanctioned by the Vatican in the early 1930's. Later, Pope Pius XI ordered the Holy See to reverse its ban on Padre Pio’s public celebration of Mass, saying, "I have not been badly disposed toward Padre Pio, but I have been badly informed." Likewise, I think Bishop Hickey and the local Bishops after him have perhaps also been badly informed about Marie Rose Ferron. Thank you once again for your comments and the information that you provided. I stumbled across your Marie Rose article last night and was edified and amazed. I was born in Woonsocket, RI and moved to CA when I was quite young. My Memere (grandma) used to speak about someone in Woonsocket who was a stigmatist, but spoke mostly of a crown of thorns. She too was from Woonsocket, but I only vaguely remember anything she told me about her. I have since sent this article to my mother, who was 3 when Rose died, but recalls afterward walking by the house and the incredible number of visitors she had. Do you know where she is buried? My mother and father will be visiting Woonsocket soon and would like to pay their respects. It is nice to hear from you. I am glad to har of your interest in Marie-Rose Ferron. "MARIE ROSE FERRON STIGMATISEE NEE 24 MAl 1902 DEC. 11 MAl 1936 AL 'AGE DE 33 ANS"
The Precious Blood Cemetery lies at the intersection of Rathbun Street and Route 114 in Woonsocket. Follow Route 126 North to Route 114 North. At the intersection of Route 114, turn left. The Cemetery entrance will be at the next intersection (Rathbun Street). Immediately after passing through the cemetery gate, bear right, then follow the road to the next small intersection (approx. 200 feet). Stop at this small intercection The tomb of Little Rose is on the left-hand side of the road, two plots away from this intersection. Feel free to contact me if you need any further info about Marie Rose. It is a pleasure to meet you. Thank you for your comments. You are really blessed to be a descendent of Marie-Rose Ferron. I have studied her heroic life quite in depth and she was certainly a VERY remarkable soul. It is really a shame that she is not better known. In fact, this is the reason I have written three articles about her. I pray, God willing, that someday she may be raised to the altars. I wanted you to know that the Anniversary Mass for Little Rose is May 15, 2011 at 9:30 at Holy Family Church in Woonsocket, RI. Also, another mass is being said for Rose on May 29 at 9:30- this mass is NOT an anniversary mass but just a second mass in memory of Rose.